More and more community members are living in areas that have little to no Jewish infrastructure. Now, almost half of the Jewish community lives a bridge or a highway away from most of the day schools, synagogues, and other centres of community life. The distance is too far to travel regularly, and most organizations do not have the capacity to expand their outreach and engage members in new areas. This geographic dispersal is changing our community’s ability to “do Jewish” together. That's where Jewish Federation comes in. Developing new programs and services in the regional communities and helping our partners extend their reach outside of Vancouver is a strategic priority for Jewish Federation. One way this is already happening is through our Connect Me In initiative, funded through the Federation Annual Campaign. Over the last year, Connect Me In delivered over 36 Jewish programs in the regional communities, ranging from potluck Shabbat dinners, to family-friendly holiday celebrations, to a tweens and teens club. One priority for members of regional Jewish communities has been to establish Jewish educational programs for Jewish children with few or no nearby options. Jewish education is associated with the development of a strong Jewish identity and involvement in Jewish community over the long term. 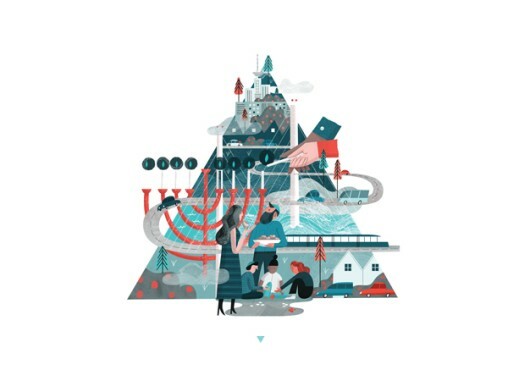 Through Connect Me In, Jewish Federation has launched two highly successful Hebrew school programs in Langley and Squamish. Thirty children completed the programs last year, learning Hebrew, celebrating Israel, developing a love of Jewish culture and religion, and appreciating Jewish art and music. Both programs are continuing in the 2018-19 school year. The Langley and Squamish Hebrew school programs were the result of two requests to Connect Me In’s micro-grant program. The new grant program enables groups in the regional communities to develop innovative programs to meet their unique needs, from yoga sessions to adult-study workshops to holiday programming. When the Hebrew school families couldn’t wait until the new school year to see each other again, Connect Me In helped them organize a family berry-picking event during the summer, for Jewish families in the area. Your gift to the Federation Annual Campaign enables regional Jewish communities to come to life and grow in size, vitality, and strength. Because of your support, families can experience the power of a supportive Jewish community and, as a result, a strong Jewish hub can grow in ways that impact our Jewish community around the entire Lower Mainland. Through the Annual Campaign, we can extend the reach of Jewish Federation and our partners so that Jews can have access to Jewish programs and services closer to where they live. Please give today. Todah rabbah!